Weleda’s former shop, whilst extremely popular, was quite a tight space and smaller footprint. Whilst the front entrance remains the same, walk into the new shop and you won’t recognise the space! Units made from upcycled and reclaimed wood line the walls with open shelving housing a rainbow of Weleda’s natural and organic cosmetics, making the open plan and airy space welcoming and vibrant. Display islands invite you to browse the new store and pause at the Tester Bar to explore Weleda’s different skincare lines or the little consultation area for those seeking advice. The company’s many natural medicines and wellbeing products will be grouped in attractive seasonal collections, such as summer travel or help for hayfever, together with books and magazines produced by Weleda, even honey from the beehives in the Weleda gardens. A new lighting system will highlight the spectrum of Weleda products. Wood and other rustic materials used in refit reflect the ethos behind the brand, from the flooring to hand crafted seating benches and wicker baskets. Weleda have involved a variety of local craftspeople in the remodelling. The shop design brings the Weleda gardens indoors, with fresh posies of wildflowers and beautiful photographs of plant ingredients grown at Weleda’s 13 acre organic herb gardens up the road at Shipley. And that’s all before we even mention the smell – fragrant essential oils wafting in the breeze to awaken the senses! You’ll find great gifts for Father’s Day, plus limited edition items and accessories that are exclusive to Weleda. 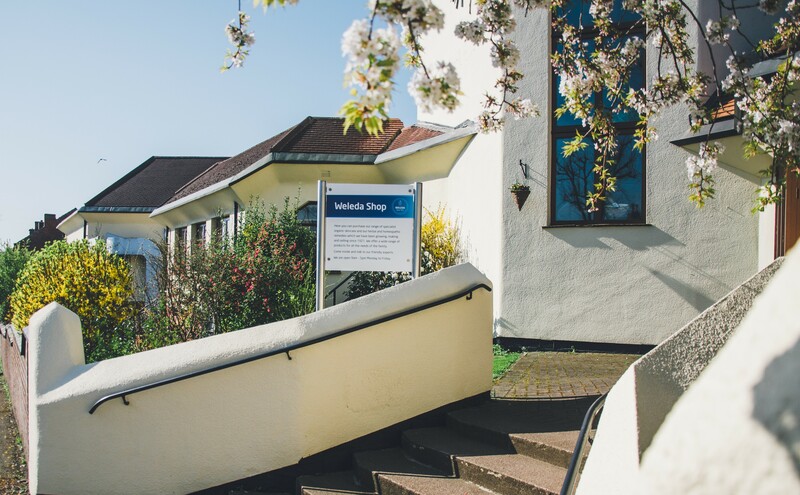 This is the only store in the UK where you’ll find every single one of Weleda’s 120 natural and organic cosmetics and the full range of 50 or so herbal and homeopathic medicines, and even more! a special 20% discount for the whole day! a selection of mini travel sizes and samples for free! On arrival, you’ll see the exterior building has also had a makeover and has been updated from its former pink paint to a lovely fresh cream colour in time for Spring!